Pawnee Buttes - In A Colorado Minute (Week 184) from Luci Westphal on Vimeo. 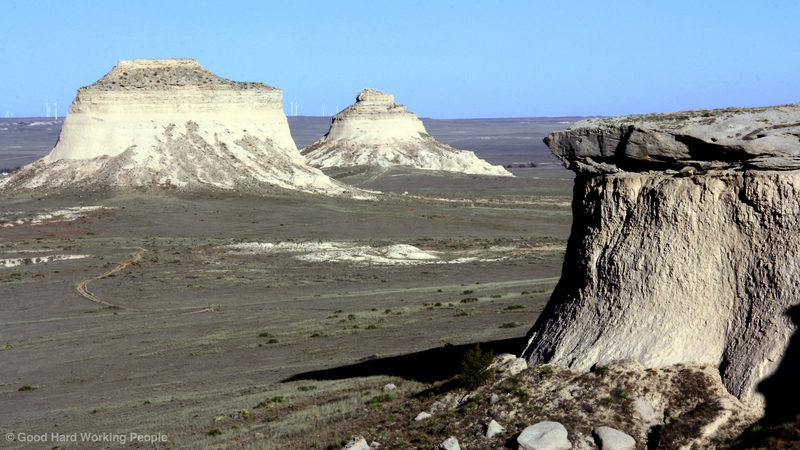 The Pawnee Buttes are two, about 90-meters (300-feet) high, flat-top hills in the Pawnee National Grassland in northeastern Colorado - about 75 minutes outside of Fort Collins. While the surroundings have worn away through erosion, the soft clay-like foundation (Brule formation) of the buttes is protected by a higher layer of sandstone mixture (Arikaree formation). The two big buttes themselves are a stunning sight. But what makes this area an even more perfect location for an outing are the chalk bluffs you can climb onto for great views or walk through their crevasses and natural trails below. There is a great natural-feeling man-mad trail on the north side of the Lipps Bluff leading you to the two Buttes. Apparently, this area is great for bird watching (but the trails are closed from March 1st to June 30th to not disrupt the nesting of falcons, eagles and hawks). However, I didn't see any birds - just an antelope, a rabbit and several grasshopper remains... oh and our dog Whiskey running around having the time of her life. Because we ran out of light the first time Scott and I went to see the buttes, I returned this past week to get more footage. The entire time I was out there, I didn't see another human being - or any signs of them except for some oil rigs in the distance. Especially when I was sitting on the lower rocks of the West Butte, looking back at the sun going down behind the Lipps Bluff (it's in the video) and the empty plain stretched before me, I felt an extraordinary sense of calm and peace. Sometimes our path is long, treacherous, leading up hills and down canyons, but then we finally arrive and realize that we are at peace within ourselves. It was an extraordinary experience to feel this serenity. And then what's next? Get up, hike some more, discover some flowers along the path and film the beautiful display of the shadow of one butte move across the other butte as the sun sets and the sky turned pink and blue. I am so happy that I can share this with you. To see more of the Pawnee National Grassland, please check out my previous video "Pawnee National Grassland – In A Colorado Minute (Week 181)"